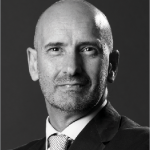 Salvatore Fundarò describes the benefits of planning filler treatments based on a deeper understanding of the facial anatomy and the changes that occur through aging. The rejuvenation of the midface with volumizing fillers has marked a turning point in the treatment of the region. The anatomic complexity of the area, the significant difficulties in evaluating the patient’s aging, and the introduction of alternative injection techniques (either with needle or with cannula) has made the therapeutic strategic choice increasingly more complicated. The variables to consider are numerous and a logical approach is required in order to manage them effectively. What are the anatomical causes for the aging in the patient? In what type of patient should we perform specific treatments and are there any alternatives? 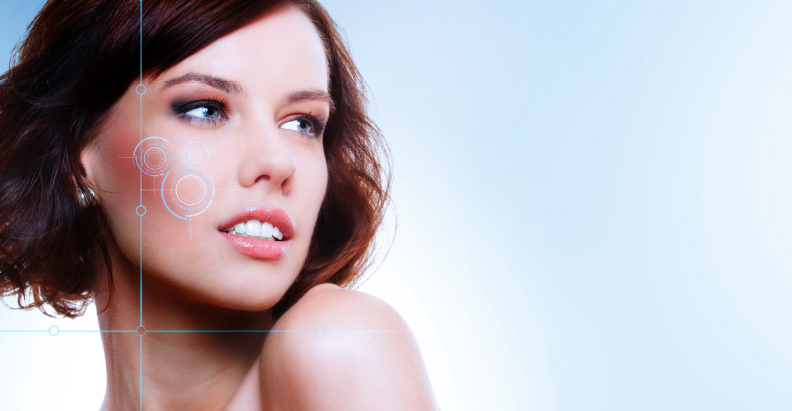 Where should the filler be injected to obtain the best possible result? Which injection technique should be used? Once these questions have been answered the therapeutic project can begin. In this way, the most suitable treatment for each patient can be defined through a logical evaluation process. A therapeutic program defined on specific characteristics guarantees a high level of aesthetic correction. If practitioners avoid standardised treatments the success rate increases, because injections will first correct the specific causes of aging and then the minor defects. Anatomologic™ is the name of the author’s approach for facial treatments described in this article. 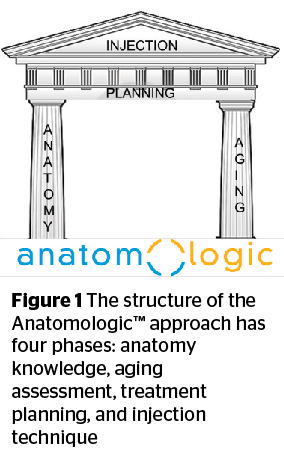 The pillars of architecture for the Anatomologic™ approach are the knowledge of facial anatomy and the analysis of the anatomical modifications that occur during facial aging. These two aspects give an answer to the earlier question referring to the anatomical causes for the aging in the patient. On these pillars leans the architrave made of the treatment planning for each patient. This gives an answer to the second and third questions. Finally, the choice of the most effective injection technique is the top of this imaginary building (Figure 1). You do not have to be an expert anatomist to use the Anatomologic™ approach. The anatomic knowledge required is very basic and focusses on the final aim: good aesthetic correction. The aging analysis and the treatment planning are purposefully synthetic, and the injection techniques are as minimally traumatic as possible. The philosophy of the Anatomologic™ approach is: Think logical. Think simple. The anatomical description of fat compartments presented in this article are the result of a wide review of the scientific literature and of eighteen hemifacial cadavers dissections undertaken at the University of Malta’s Department of Anatomy. As suggested by Rorich and Pessa1, clinical observation and laboratory investigations show that the subcutaneous fat of the face is highly partitioned, that it is not a confluent mass, and it exists in distinct anatomical compartments. The fat compartments are determined by fascial membranes that arise from the superficial fascia and attach to the dermis of the skin2. The midface fat compartments are classified as either superficial or deep. It’s very important to distinguish between these two different categories. The superficial fat compartments are located between the skin and the plane of the Superficial Muscular Aponeurotic System (SMAS). The SMAS is a continuous and organized fibrous network connecting the periosteum, the facial muscles, or other fascial types (such as parotid fascia), with the dermis. It consists of a three-dimensional architecture of collagen fibers, elastic fibers, fat cells, and muscle fibers3–5. The fat tissue of superficial compartments is located within this fibrotic network. Under the SMAS plane, posteriorly to the mimetic muscles, we find the deep fat compartments that reach and adhere to the periosteal plane. The fat compartments of the cheek are described below and can be found in Figure 2. Its superior margin corresponds on the skin surface to the tear trough and to the palpebro malar groove (Figure 3). In fact, the superior boundary of this compartment is the orbicularis retaining ligament that originates 1–2 mm inferiorly to the margin of the orbital cavity and, passing through the orbicularis oculi muscle, reaches the dermis9,10. According to Muzzafar et al, this ligament spans from the periosteum, just outside the orbital rim, to the fascia on the undersurface of the orbicularis oculi muscle11. The orbicularis retaining ligament contributes to the formation of the tear trough and palpebro malar groove. Positioned cranially to these two grooves, the palpebral part of the orbicularis oculi muscle is found immediately under the skin of the eyelid; caudally to them, the orbital part is covered by infraorbital fat. Inferiorly, the infraorbital fat is defined by the zygomatic cutaneous ligament12. Mendelson described zygomatic ligaments medial to the junction of the arch and body of zygoma, located along the origins of the facial expression muscles as the the zygomaticus major, zygomaticus minor, and levator labii superioris13. At the level of the junction of the arch and body of the zygoma, just lateral to the origin of the zygomaticus major muscle, this ligament becomes thicker and stronger and is described as the McGregor patch14. The fat of this compartment has a high tendency for water retention. Frequently being the site of persistent oedema it often forms the so called malar mound6,15. It is located caudally to the infraorbital fat from which it is separated by the zygomatic cutaneous ligament (Figure 3). It has a triangular shape and is wedged between the infraorbitary and nasolabial fat. Laterally, this compartment is bordered by the zygomaticus major muscle and the middle cheek fat. Infero-medially to the medial cheek fat is the nasolabial fat, which is positioned parallel to the nasolabial fold. With an oblong form, it lies laterally to the nasal pyramid and parallel and cranially to the nasolabial fold. The orbicularis retaining ligament represents the superior border of this compartment. It borders supero-laterally with the medial cheek fat, infero-medially with the nasolabial fold. Its inferior part borders and overlaps the superior jowl fat. Located laterally to the medial cheek fat, it is bordered superiorly by the zygomatic ligament. Above this compartment the ligament is thick and constitutes the McGregor patch. The middle cheek fat does not extend above the inferior margin of the zygomatic arch. Anteriorly it is bordered by the masseter ligament that begins inferiorly to the McGregor patch and descends vertically along the anterior border of the masseter muscle. The ligament arises from the fascia of the masseter muscle and inserts into the SMAS and the overlying dermis of the cheek. The middle cheek fat laterally borders with the lateral temporal-cheek fat. The parotid-masseter septum divides these two compartments. Caudally to the middle cheek fat we find the inferior jowl fat. Is the most lateral compartment of the cheek. This fat lies in direct contact with the parotid gland and connects the temporal fat to the cervical subcutaneous fat. The cheek section is firmly attached to the parotid fascia. It is inferior to the nasolabial fat and it is lateral to the modiolus. Its lateral boundary is the middle-cheek fat. Located inferiorly to the middle-cheek fat and the superior jowl fat. Its medial boundary is the mandibular ligament and its posterior boundary is the lateral temporal-cheek fat. The inferior boundary is determined by the mandibular septum. 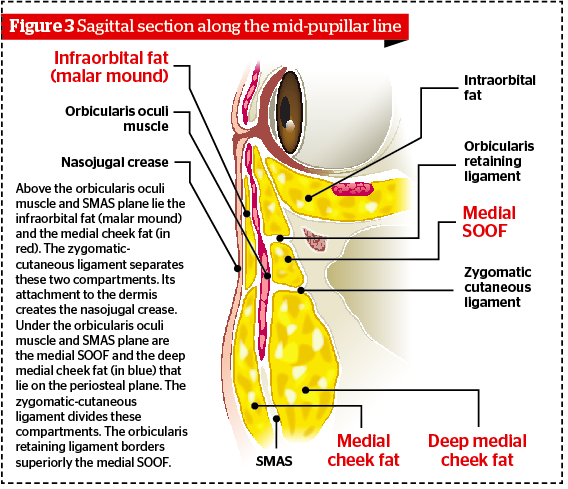 The first three superficial fat compartments (infraorbital, medial cheek, and nasolabial fat) are described as a unique anatomical structure: the malar fat pad. It has a triangular shape with the base parallel to the nasolabial fold and with the apex near the malar projection. The malar fat pad is loosely attached to the deep plane (SMAS), but it is firmly attached to the skin16. The malar fat pad is supported in its location in youthful individuals by multiple fibroelastic fascial septa that extend through the fatty cheek mass originating from the underlying superficial fascia, which allows the mimetic muscles to attach to the overlying cutaneous dermis17. It lies adherent to the periosteum along the orbital rim18, inferiorly to the orbicularis retaining ligament and under the orbicularis oculi muscle (Figure 3–4). It extends from the medial limbus to the outer cantum. The zygomatic cutaneous ligament separates the medial SOOF from the deep medial cheek fat. Located at the lateral orbital rim in the sagittal plane (Figure 4). The lateral orbital thickening represents the upper-limit of the lateral SOOF and does not extend superiorly to the lateral canthus. Its medial half is covered by the orbicularis oculi muscle. It lies above the prominence of the zygoma but does not reach above the superior margin of the zygomatic arch. The lateral SOOF lies above another more deeply situated fat compartment, therefore it is not directly in contact with the periosteum18. Located under the SMAS plane, its superior part lies under the orbicularis oculi muscle (Figure 3–4). Its superior boundary is the zygomatic-cutaneous ligament that divides it from the medial SOOF and it laterally borders with the buccal fat and with the zygomaticus major muscle. The medial boundary is the pyriform ligament surrounding the nasal base, and the inferior boundary is the sub–orbicularis oris fat. This fat compartment lies on the periosteum of the maxilla. Between the periosteum and the fat compartment a potential space is present, defined as Rislow’s space8. Other authors19 describe this compartment divided into two parts: the medial part, located beneath the nasolabial fat, does not lie immediately on the periosteum of the maxilla but is bordered posteriorly by another small, triangular compartment; the lateral part is located under the superficial medial cheek fat and is positioned directly on the maxilla. Located inferiorly to the zygoma and anteriorly to the ramus of the mandible surrounding the medial pterygoid and masseter muscle. This fat compartment has a buccal extension adjacent to the medial cheek fat, the deep medial cheek fat, the middle cheek fat, the sub–orbicularis oculi fat, the jowl fat, and the fat of the pre-masseter space. Gierloff et al., in their computed tomography study have observed a hypothetical anatomical boundary between the buccal extension and the buccal fat pad. They have hypothesized that the buccal extension can be regarded as a distinct fat compartment19. Other authors share this theory20. Often, injectors can have some difficulty understanding the specific localization of the fat compartments and, consequently, treating them accurately. This can be a difficulty especially for doctors that have no experience with cadaver dissections and anatomic studies. Improving knowledge of these aspects is essential to increase the effectiveness of treatments. The fat compartments undergo specific modifications due to the aging process. Sometimes the changes are hypotrophic, other times they are hypertrophic or ptotic. The ability to understand the changes occurring related to the aging process is essential in order to correctly plan a treatment with fillers. The aging process causes a global volume increase in the medial cheek fat with an inferior volume shift within the fat compartment. The volume increases in the lower two thirds and remains stable in the upper one. Undergoes an inferior volume shift of fat tissue. In elderly patients, the sagittal diameter of the upper third is smaller and the sagittal diameter of the lower third is higher19. This modification creates an overall hypertrophy of the lower part of the malar fat pad due to the ptosis and caudal migration of fat tissue. 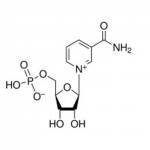 Aging of the malar fat pads can be described as ptotic/hypertrophic. The ptosis and the hypertrophy of these fat compartments contributes to the increase in the depth of the nasolabial fold17. As the malar fat pad is loosely adherent to the SMAS plane, its aging is characterized by ptosis, caudal migration of fat, and hypertrophy. These modifications produce an increase of convexity to the central portion of the cheeks. Located adherent to the parotid fascia without any deep fat compartment between it and the fascial plane. The aging determines a hypotrophic involution and it usually does not have any tendency for caudal migration. Both lie on the periosteum and have an aging characterized by hypotrophy with a low tendency for ptosis. The hypotrophic involution of medial SOOF produces the formation of the hollow in the infraorbital region. Reduction of the medial SOOF has been noted to increase the orbital cheek crease and the ‘V’ deformity of the lower-lid described by Mendelson et al13. The medial SOOF acts to support the palpebral tissues of the inferior eyelid, so its volume reduction increases the relaxation of the tissue of the inferior eyelid and of the intraorbital fat. The hypotrophy of lateral SOOF decreases the projection of the malar area and cheekbone, facilitating the ptosis of superficial fat compartments of the cheek. This compartment undergoes a gradual and global decrease of volume and a caudal migration. The hypotrophy is greater in the upper two thirds and minor in the lower third where the caudal migration of fat compensates the hypotrophy. The area of this fat compartment that influences the aesthetic of cheeks is the buccal extension. It seems to be mainly affected by hypotrophic aging. Several authors have observed a lower volume of buccal extension in older patients19,21. The deflation of this fat compartment leads consequently to a lack of support for the medial cheek and middle cheek fat, aggravating the descent of these compartments. Other authors22,23 have observed an antero-inferior protrusion of buccal fat that increases the convexity of the cheeks and jowl ptosis. Now the two pillars of the Anatomologic™ approach (anatomy and anatomy of aging) have been introduced, the physician should use this knowledge to plan the best filler treatments for different patient types. The knowledge of anatomical changes related to the aging process can guide the physican’s choice and suggest which fat compartments should be treated and volumized. This phase is crucial because if the physican chooses an inappropriate treatment the patient will probably have a partial or lacking result. If, however, the planning is correct, the results will be satisfactory. To facilitate the treatment choice the author uses a personal classification of the aging types that simplifies the patient’s placement and the treatment planning: the Aging Type Classification of Midface (ATC Midface)(Table 1). First of all, physicians have to consider that deep fat compartments predominately need an augmentation of volume. 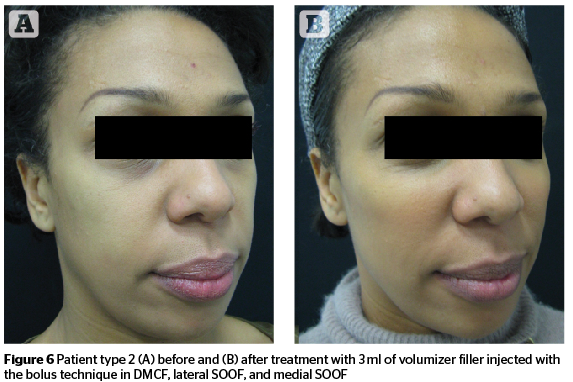 For this reason, plan patient treatments with volumizer fillers with a high elastic and viscous moduli (G’ and G’’) that, by definition, can give the volume augmentation required. These fillers can have a lifting action only if injected in specific anatomical regions within specific deep fat compartments that, regaining their lost volume, have a lifting action on the superficial fat compartments. In type 1 and 2 patients, physicians have to first treat the main defects, which are volume reduction of the deep medial cheek fat and lateral SOOF. Therefore, to reduce the adipose hypotrophy, physicians first need to enhance the volume of DMCF. With this first correction, a volume augmentation and an initial lifting action of the soft cheek tissue will be achieved. Next, the physician should treat the lateral SOOF, enhancing the cheekbone projection, and further increasing the lifting action of the soft cheek tissue. In type 2 patients (hypotrophic/ptotic), it will be beneficial to augment the quantity of filler injected in lateral SOOF because they need a greater lifting action than type 1 patients. Lastly, the author would treat the medial SOOF to correct the hollow in the infraorbital region (Figure 5–6). In type 3 patients (ptotic/hypertrophic) the main defects are ptosis and the downward migration of adipose tissue of the superficial fat compartments. In this case, physicians have to lift the ptotic fat compartments but to do this they have to increase the volume of lateral SOOF. The volume restoration of this compartment will augment the projection of the cheekbone and will give a lifting action to the superficial fat. Only after the assessment of the obtained lifting action, the physician will be able to increase the volume of the DMCF. 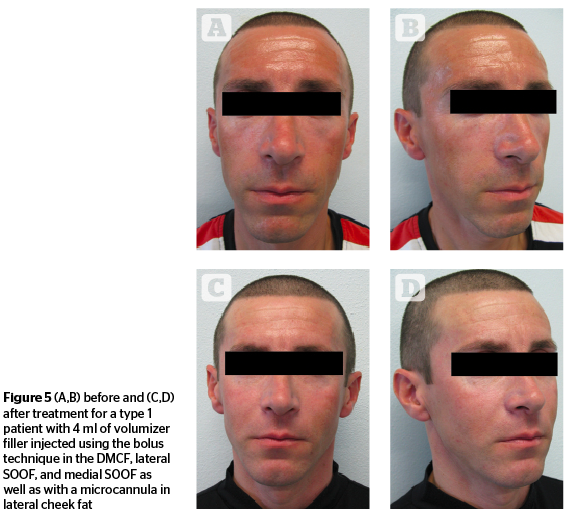 Attention must be paid not to inject too much filler in the DMCF because the inferior part of the maxillary region is already characterized by hypertrophy and volume excess in this patient type. In type 3 patients it will be necessary to treat the medial SOOF to eliminate the infraorbital hollow (Figure 7). A similar approach was used with type 4 patients in which it was necessary to augment the volume of lateral SOOF to lift the soft cheek tissue and to balance the excessive volume in the inferior part of the maxillary region. The DMCF is usually not treated if not in its higher location at the border with the lateral SOOF. The main strategies of the treatments are summarized in Table 2. Most superficial fat compartments have an aging process characterized by ptosis and hypertrophy. 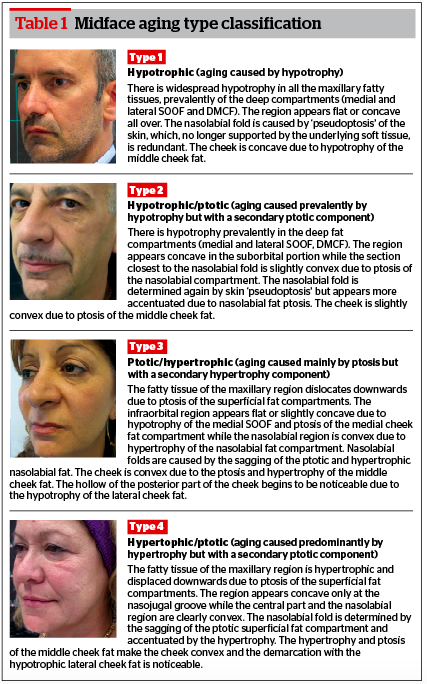 Only lateral temporal-cheek fat is characterized by a hypotrophic aging process. The treatment of superficial fat must be accurate to avoid adding too much volume and increase the ptosis. For these reasons the author recommends use of fillers with intermediate G’ and G’’ in these compartments. Only in lateral temporal-cheek fat does the author suggest using a volumizer fillers with high G’ and G’’. 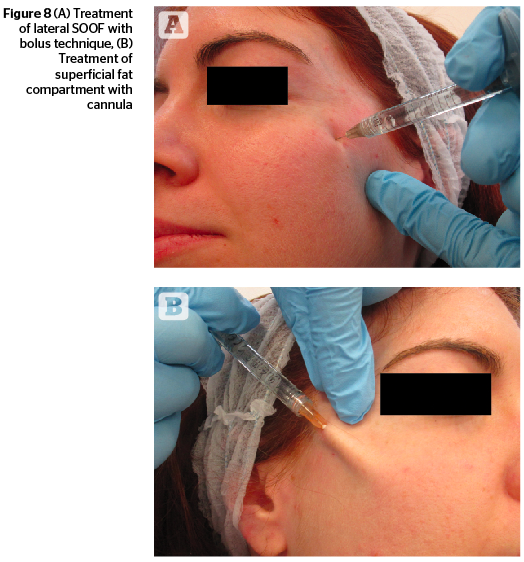 The infraorbital fat has a high tendency for water retention and for this reason the author does not suggest treating with fillers of hyaluronic acid that, due to their hydrophylicity, can increase the oedema. In type 1 patients it will be useful to inject the medial cheek fat and the nasolabial fat to complete the volume enhancement that begun from injecting the DMCF. In type 2 patients only treat the medial cheek fat to avoid increasing the initial ptosis of the nasolabial fat. In those patients with hypotrophic middle cheek fat, treat this compartment to reduce the concavity of the cheek. In type 3 and 4 patients, the author does not treat the superficial cheek fat compartments because in these patients they are already hypertrophic and any treatments could increase their ptosis. Special reference needs to be made to the lateral temporal-cheek fat. It is characterized by a hypotrophic aging process and for this reason it can often be treated with fillers. The volume restoration of this compartment causes the reduction of the pre-auricular hollow and gives a lifting effect to the middle cheek fat and the soft tissue of the jawline. 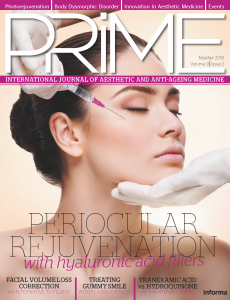 The author regularly treats the deep fat compartments of the midface with a volumizer filler of hyaluronic acid (HA) or of calcium hydroxyapatite (CaHA) with a high elastic and viscous moduli (G’ and G’’). The use of filler with lidocaine reduces the pain and makes the treatment more comfortable for patients24–26. The injection technique used for the treatment of deep fat compartments is the preperiostal bolus technique. In the author’s experience, it is the most effective and least traumatic because it allows for a precise injection and the path of the needle through soft tissues is as short as possible. With good experience, physicians are able to treat every single fat compartment with a single injection. In this way, physicians no longer need to perform other injections, which increases the possibility of bleeding and bruising. Volumetric restoration occurs at the level of the deep fat compartments that are most subject to hypotrophy and, therefore, the bolus technique guarantees an anatomically correct volumetric correction. The volume is increased in the deep fat compartments subject to hypotrophy and not in the superficial fat compartments that prevalently undergo ptotic/hypertrophic aging. The bolus technique is suitable in the treatment of single compartments because it allows an anatomical precision of injection superior to other techniques. The bolus is injected inside the specific fat compartment and all the filler contributes to the volumetric correction of the compartment without useless dispersion in other anatomical localizations. This causes a better performance of the injected product. The injection given using this technique allows the filler to be placed in the deep fatty tissues which, as we have seen, are the ones that are most attached to the underlying periosteal level. 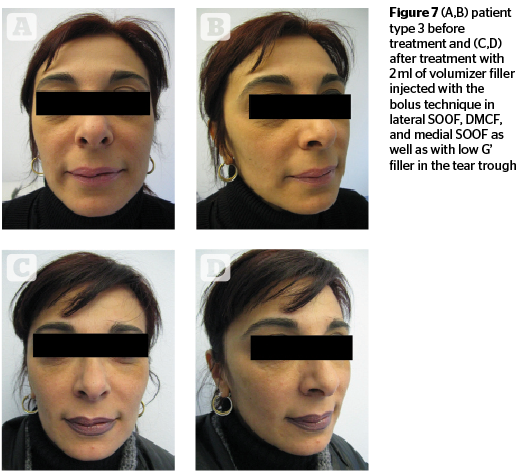 Insertion of filler in these particularly stable compartments, which are not too subject to ptosis, prevents it from migrating due to the effects of gravity. All deep fat compartments are treated with the same bolus technique. The injection is done by inserting the needle vertically to the underlying bone plane until the tip is touching the periosteum (Figure 8). After withdrawing the needle by a few millimeters and ascertaining, by withdrawing the plunger, that vessels have not been penetrated, the author proceeds with the supraperiosteal release of a bolus of the product. The amount of product injected for each release varies according to the deficit to be corrected. It is recommended not to exceed 0.5 ml for each main release and for each single point in order not to risk overcorrection. It is possible to integrate it with another injection immediately after the first one following the evaluation of the effect obtained. It’s important to massage the product after injection to equally distribute it inside the fat compartment. The superficial fat compartment is treated using a microcannula (25G). The microcannula is flexible with rounded ends that can go through the fat compartment in multiple directions without damaging the vessels and nerves. The filler is released through a small hole placed laterally, thereby allowing a uniform and regular outflow. The microcannula is inserted through an entry point made with a needle that has the same or a slightly larger diameter than the one of the microcannula, so as to allow the cannula to penetrate easily. When the cannula is inserted, it is slowly slid above the SMAS plane, releasing the filler by means of an antero-retrograde fan-wise technique (Figure 8). This technique allows for an homogeneous spread of filler within the compartment with a low rate of side-effect thanks to the atraumatic design of the microcannula27. The amount of product injected for each superficial compartment varies according to the deficit to be corrected. It is important to avoid the overtreatment of these compartments because their superficiality exposes the risk of unnatural and excessive corrections. In the author’s experience, the Anatomologic approach has proven to be safe and extremely effective. It has increased the correction capability of the age related defects of the midface. There is a low rate of side-effects and complications. When treating the deep fat compartments with the bolus technique it’s important to remember to make sure not to inject inside vessels, withdrawing the plunger before injecting. The intravascular injection is in fact the main cause of serious complications that can occur in this area (expecially in the infraorbital zone) including skin necrosis and/or ischemic injuries of the retina. McGregor M. Face Lift Techniques. Presented to the Annual Meeting of theCalifornia Society of Plastic Surgeons. Yosemite, California, 1959.